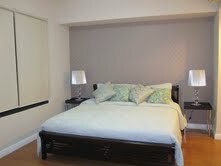 Fully furnished , complete with NEW beddings, Table ware, kitchen ware. Towels. All appliances are included – Refrigerator, Microwave, stove, Washer and Dryer, TV. 5 split type aircons for all rooms and living and dining rooms. Big windows to show Bel Air View in all areas of the house. No power interruptions, will never have any blackouts. Rent 130K a month, inclusive of dues.1 yr contract. Rockwell Club has a bigger pool, gym, gymboree for kids, spa, function rooms, more sports activities, restaurants.. CALL 0917-8225798 to schedule ocular.